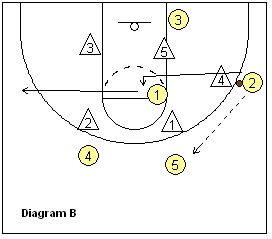 See Rick Torbett's Betterbasketball Read and React Zone Offense. Pass and Cut - becomes "hook and look (and hold)". Our perimeter passer cuts, but instead of a basket cut, makes a button-hook type cut into a seam or gap in the zone. He will hold there until the next pass is made and then fill out to the perimeter. Our circle movement is the same, filling the spots. 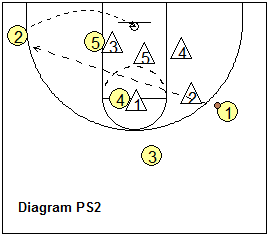 Against the 2-3 zone, these are slower "banana" cuts into the gaps and short corner. Against the 1-3-1 zone, using a 4-out set, we will make quick basket cuts, attacking the low defender, while our post player plays high at the free-throw line, occupying the middle zone defender. 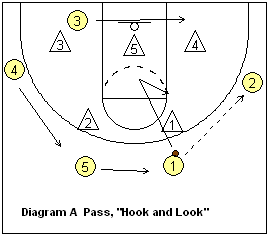 When using either a 5-out or 4-out (1-in) set, we use "hook, look and hold". If we were to play with a 3-out, 2-in set, our cutters would immediately clear out, as three players inside would clog things up too much. 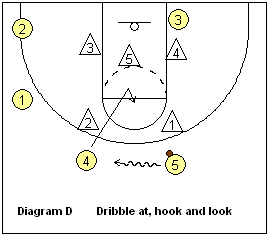 Dribble at, Back-cut - is the same, except against the 2-3 zone, the cutter makes a button-hook cut into the zone and follows the "hook, look and hold" rule. Versus the 1-3-1 zone, he would make a basket cut to the rim. The same thinking applies whenever the defender is denying over the read line. 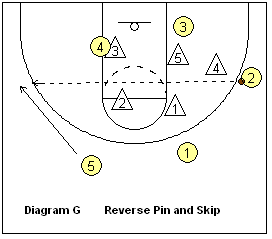 We back-cut with a button-hook cut (2-3 zone) or rim (basket) cut (1-3-1- zone). Pin and Skip - no changes are made here, as the pin and skip are really made for attacking zones, as well as man-to-man help-side defenders. We can either pin the defenders inside, giving us a 3-point shot, or pin the defenders outside, giving us an inside shot. 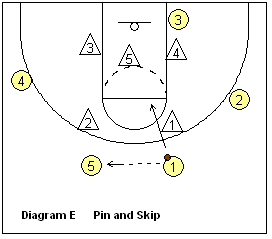 A double pin-screen (two in a row) is usually good (diagrams E-G). You can often feed the post after a pin-screen and skip to the corner or wing. When this happens, the passer should Laker cut and the other perimeter players circle rotate as usual. 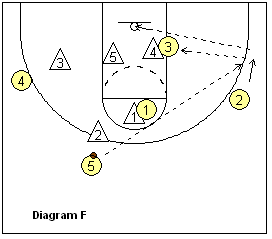 Diagram H shows the feed into the post after the skip pass. 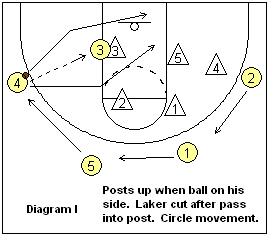 This is followed by a Laker cut (high or low), as the perimeter players circle rotate. Some coaches may tell their post player to stay on just one side of the court (here the left side). He/she may occupy the low block, elbow and short corner on that side. 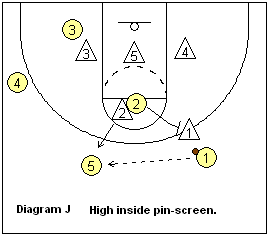 When the ball is opposite, the post player always pin-screens. When the ball is on his/her side, the post player posts up and looks to get the pass inside. Diagram S shows a fake pin and skip. 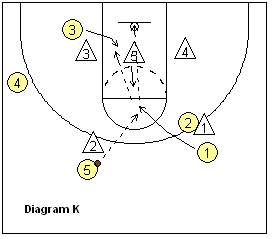 O4 initially screens the back-side of the zone and O5 drops into position for the skip pass. As the X3 defender moves around the screen, O4 cuts ballside for the pass from O2, and an open shot. We can also pin (screen) the defender outside. Diagram J shows a guard-to-guard pass. O2 is inside after a previous pass and button-hook cut. O2 pins the X1 defender. 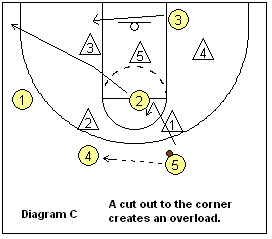 O1 cuts inside for the pass and pull-up jump shot, or dump to O3 inside (if X5 comes up to defend). A natural pitch out to O4 is also an option. Dribble-At, Back-cut with Pin and Skip - here is a simple way to get a pin and skip and an open 3-point shot for your shooting guard O2 against zone or packline defenses. 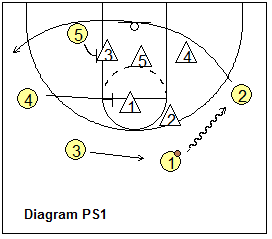 Diagram PS1 shows the 2-3 zone defense with the offense in a 4-out set. O1 dribbles at O2 and this triggers O2 to automatically back-cut through to the opposite corner-wing area. 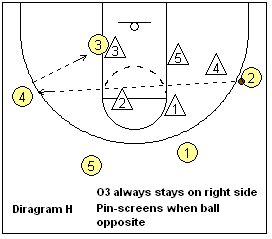 Meanwhile, O5 pin-screens the weakside low defender X3 while O4 pin-screens the weakside top defender X1. 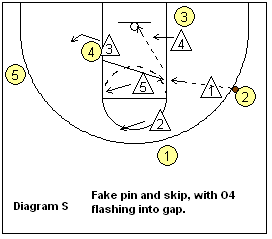 O1 skip-passes over to O2 for the open 3-point shot (diagram PS2). O2 could also pass inside to O5 if the X3 defender slips around the pin-screen to guard the shooter. This could be run for any of the perimeter players using the dribble-at, back-cut principle... the back-cutter cuts through to the opposite side while teammates recognize this and set the backside pin-screens. Get the rest of the article, which includes dribble-penetration options, ball in the corner options, and attacking trapping zones. Become a Premium Member.